Adrian Lam will hit the ground running when he arrives at Wigan today. That’s the prediction of Warriors’ executive director Kris Radlinski, who has been in regular contact with incoming coach Lam. 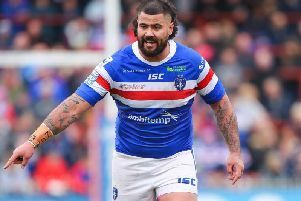 And Radlinski says his former Wigan team-mate can’t wait to begin preparations for the 2019 campaign. He said: “I’ve been speaking to Lammy every couple of days, he’s had Skype conversations with the staff and conversations with a lot of the players. Lam, a former Queensland captain,became a firm fans’ favourite at Wigan during his four-year playing stint from 2001. He is the current Australia assistant coach and has previously had roles with Cronulla, St George Illawarra and Sydney Roosters. He succeeds Shaun Wane and will hold the fort for a year until Shaun Edwards takes charge in 12 months’ time. When he was unveiled alongside Edwards in August, chairman Ian Lenagan said his short-term appointment could be a launchpad towards getting a head coaching position in the NRL in 2020. “He realises this is a great opportunity for him and I think he’ll do great,” continued Radlinski. “When he gets over we’ll have some away days with the staff and the senior players. The majority of the non-international players return for pre-season training next Monday. Wigan are also expected to launch their new strip, complete with new main sponsor, next week.